The European soybean production is expected to increase nominally, owing to the decline in soybean acreage in countries, like Bulgaria, Slovakia, Austria, and Italy. The market for soybean seed treatment is expected to show the same trend, at a minor CAGR of 5.2% during the forecast period. The soybean production is expected to grow at a marginal rate and the increase can be attributed to the incentive policies under Common Agriculture Policy (CAP). According to the USDA report on oilseed production in EU, it is expected that the production of soybean will increase between 2017 and 2018, but at a lower rate as compared to 2016 and 2017. The increase in production, as well as acreage are expected to drive the demand for seed treatment. Seed treatment of soybean, one of the most important European crops, helps increase yield. This, in turn, reduces pressure on imports from Brazil and Argentina, accounting for 80% of Europe’s soybean consumption. Owing to this, the seed treatment market for soybean increased manifolds in Europe. With regard to bean leaf beetles and soybean aphids, it is estimated that 45% to 50% of soybean is now treated with both insecticide and fungicide for higher yield and protection. 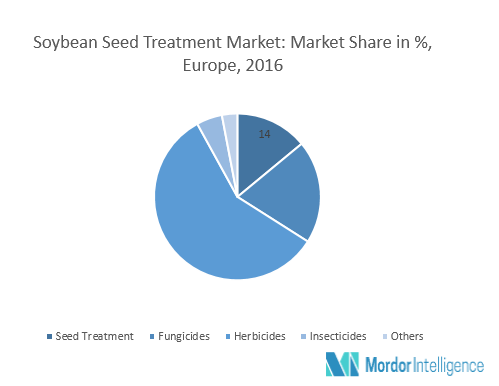 The seed treatment in Europe for soybean has the merit against sporadic and unpredictable pest infestations but these benefits are not widespread. The use of seed treatment on soybean crop can protect the yield, but when there is no pest the use of seed treatment is like an insurance. Only in the case of high risk from early season pest, the seed treatment has very high significance, else it is only an extra process. Until 2015, the EU imported over 33 million metric ton of soybean and its related commodities from North and South America every year. But lately, there have been increasing concerns over this because exporting countries, like Brazil, Argentina, and the United States, mainly cultivate glyphosate-tolerant genetically modified organism (GMOs) varieties. With the on-going controversies related to glyphosate and the extension on its usage over the next five years, this is hampering the market. In Europe, the subject of GMO versus non-GMO is already an important factor promoting the idea of a domestic soybean market, and therefore, more number of seeds are being treated to supplant the imports, and hence, driving the seed treatment market for soybean. Major players: Bayer CropScience AG, Plant Health Care, Syngenta AG, BASF SE, Adama Agricultural Solutions Ltd., DowDuPont, and Advanced Biological Marketing Inc. among others. 7.2 Advanced Biological Marketing Inc.